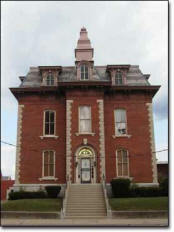 Currently, the Hancock County Prosecutor's Office is located in building that formerly housed the Hancock County Sheriff's Office and Jail. Since its renovation, the jail cells have been removed and much needed office space, conference room space, and storage space was created. The Prosecuting Attorney, whose office is provided for in the Indiana Constitution, is elected in each judicial circuit for a term of four years. Hancock County is in the 18th Judicial Circuit. The Prosecutor, along with his or Deputy Prosecutors represents the State of Indiana and prosecutes violators of the state statutes in various courts in his judicial circuit having criminal jurisdiction. The office is not strictly a county office since the prosecutor is elected for a judicial circuit in the same manner as Judges.